Well, another Field Day operation is in the books and weve significantly improved our contact total over last year (1503 vs 1163). We operated in the same class as last year - 6A (meaning 6 transmitters powered independent of the commercial mains). We had our share of challenges this year  no 100 crane to hold up one end of all the dipoles and the VHF antennas but we managed to sling lines over the parking lot light standards and used Gord VE3EOSs portable telescoping mast as an additional anchor point. Another challenge was that neither of the 2 generators loaned to us had any output  I guess they had been abused when they did Ice Storm 98 duty and hadnt been tested since. Fortunately, Ben VA3BNY saved the day when he just happened to have a virtually new 5500 watt generator in the back of his truck. Thanks also to Charles, for the loan of the extra logging laptop. However, by the time 1800 UTC (2PM local) June 26 rolled around we had everyone set up and ready to go. 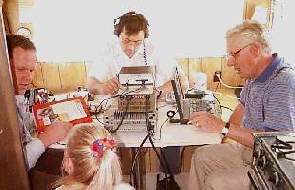 We had last years trophy-winning 20m CW team of Walter VE3NEI, Dave VE3RBA and Bob VA3MCK operating from Daves RV affectionately dubbed the Spruce Moose (if you saw it, youll know what I mean). 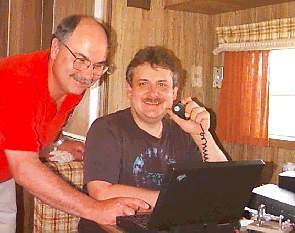 Dave VE3PMT and Paul VA3VCI were also operating their traditional 80m SSB outside Daves motor home. 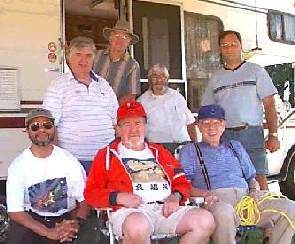 Paul VE3SY operated his traditional 40m SSB from Bill VE3WDLs motor home and second generator. Gord VE3EOS was also there with his hamily (Linda with the newly minted VA3LWH, Gwil VE3GIM, and the yet unlicensed Colin). 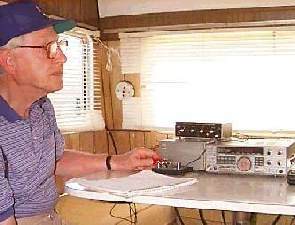 Gord was not originally planning to operate but, as I had an extra HF rig and tuner, we improvised an antenna and convinced him to run 160m again this year. Tedd VE3TJD and Mark VE3THG were also there in Tedds trailer but restricting themselves to 6m this year, assisted by Ben VA3BNY and Bill VE3WDL. 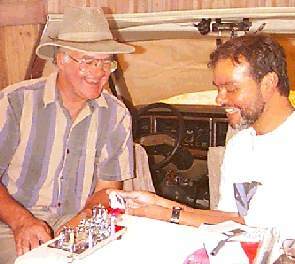 Jonathan Doll VE3CBX was co-located with Paul VE3SY, mainly on 15m CW, but also operating 40CW and 6CW. 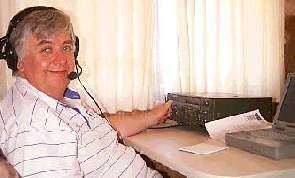 Iulian VA3IUL a friend of Jonathan worked the last 30 minutes of the contest on 40 CW and racked up 35 more Qs. After all the dust had settled, the burgers (thanks Dave VE3PMT), chili and tarts (thanks Hubie VA3BIQ and XYL Eileen) and breakfast (thanks Marg VE3BLJ) eaten, the results were tabulated by our panel of experts (me) as follows: OH! By-the-way. I made my first HF contact during the contest on 160 SSB. Roaming helper thanks goes to Dave VA3MRJ who assisted with the contact count on most bands. That means we will be submitting a claimed total of 3874 for contacts alone to the ARRL. Since we won the 6A ONT category last year, we should be a shoe-in to repeat this year. Next year, we will hopefully be changing locations again as Dave VE3PMT has volunteered to scout locations. See you all June 24-25 2000! Here is our Scrap Book of Field Day 99 photos taken by Ben VA3BNY with a digital camera. A late addition to the FD Scrap Book are the two band captains for 6 metres. Mark VE3THG (standing) and Tedd VE3TJD at the microphone. The 6m crew racked up over 150 contacts during a few openings. Dave Johnson VA3MRJ (left) enjoys some humor with Jonathan Doll VE3CBX as Jonathan takes a break from 15 CW. Jonathan still uses his original Vibroplex jewled bug that he modified for paddle use. 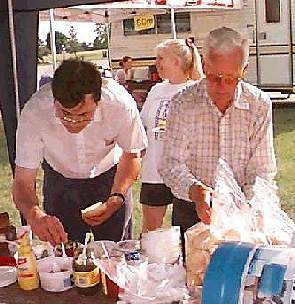 Supper time and this time we show Hubby (right) enjoying some burgers courtesy of M&M Meats and Dave VE3PMT. With Hubby is Dave VE3RBA and his friend Jane. Hubby and Eileen Stumpf once again served up their excellent chili. 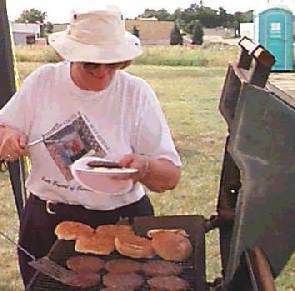 Marg Cassel VE3BLJ serves up some of the excellent M&M burgers for the motley FD crew. Marg also did a Sunday morning run to the Golden Arches for the breakfast to feed the overnight operators. Our photographer this year was Ben VA3BNY shown operating the 6 metres station. The band went from Hot to Cold but stayed open enough to give the team 150 contacts. Joe VE3VXO is on the mic while his daughter does some logging. Dave VA3PMT the 80 phone band captain looks on. 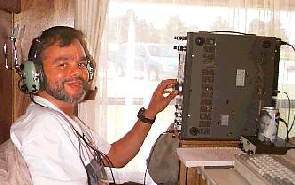 Paul Cassel VE3SY took on 40 SSB and was able to work over 700 contacts. Joe VE3VXO and Jonathan VE3CBX added about 75 CW contacts as well. 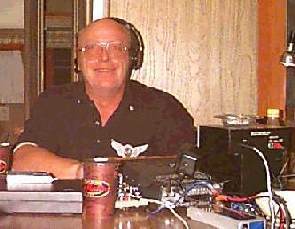 Walter VE3NEI took on 20 CW again this year and was able to work just shy of 300 stations. CW made a good comeback this year with 2 pure CW stations. Jonathan Doll VE3CBX last worked FD with us in 1972. His favourite mode is CW. The TS940 was propped on end to make more room for his 15 CW station. 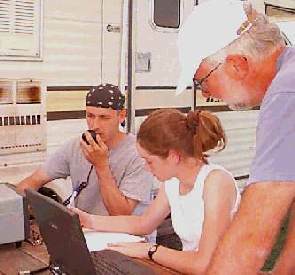 The team on 20 CW with Walter VE4NEI right and Dave VE3RBA center. A visitor to the shack on the left talks with Jane about the days event. Thanks to Ben VA3BNY for preserving this years event in digital format.